If you follow the convention circuit at all, you may have noticed something at this year’s Consumer Electronics Show (CES) in Las Vegas; it may be a small thing, but it could have an outsized impact on the trucking industry. The Continental tire company showcased a driverless vehicle that could be used to deploy delivery robots. This would be especially helpful for last-mile customers who are not physically able to take receipt of the packages. And this is not the only example of companies pushing ahead with automated solutions to trucking problems. If anyone has any doubts about how technology is reshaping the transportation sector, this news should be a wake-up call. Consider that the Consumer Electronics Show – one of the biggest of its kind in the world – used to be a haven for nothing more than computer geeks and gamers, yet now attendees can feast their eyes on all sorts of technologies related to business, healthcare, and transportation. Some are wondering why Continental, which is Germany’s largest tire manufacturer, is getting in on the game of autonomous vehicles. According to the company themselves, they always were a technology company, pioneering pneumatic tires back when that was considered bleeding edge technology. Now, with global automotive technology undergoing a major sea change, Continental is once again trying to position itself as a major technological innovator. Yet, to see a tire company moving into driverless technology certainly is a bit of a surprise. Continental displayed how a small, driverless vehicle could house delivery robots that look much like small dogs and to deliver packages to handicapped or disabled people. 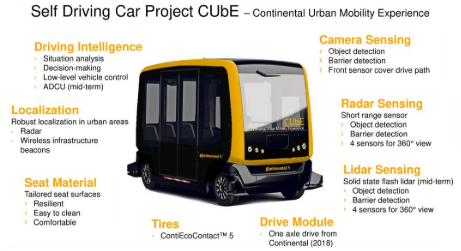 Continental released a statement saying that the vehicle and its robots, what they refer to as the Continental Urban Mobility Experience (CUbE), offer a more effective and efficient distribution of goods. The company also highlights potential sustainability goals by saying that this technology will reduce idle times and ease packed transport capacity. In densely populated areas, these technologies will help prevent bottlenecks and, when powered by electric technology, ease fuel usage. Fortunately, Continental still foresees the need for human interaction in this process. Although the vehicle and delivery robot technology does not require a specific person on the vehicle, there will still need to be a technician, or operator, who works as part of the last-mile technological team. Continental is essentially making the case that goods and parcel delivery in residential areas is not only growing, but it will continue to evolve over time as people increasingly get their consumer goods delivered through e-commerce sales. As these sales grow, and people receive their packages in dense urban areas, delivery cost per hour is going to be increasingly important. As more last-mile delivery vehicles crowd out the nation’s urban areas, the companies that handle last-mile delivery will need to find tomorrow’s solutions for today’s problems. Therefore, companies like Continental are looking at automation as a potential way to meet that goal. In fact, industry analysts state that within the next decade, we could see automated goods delivery make up a full 80 percent of all last-mile deliveries. The term that many are using to describe this situation is “future urban mobility.” The expectation is that this futuristic form of urban delivery will compliment conventional goods delivery methods. As truck drivers and warehouse workers prepare parcels for the final mile, driverless vehicles like the CUbE, supplemented and operated by technicians, can carry delivery robots to handle the last yards of the logistics chain. Even more the technology already exists to make this a potential reality. Reliable, robust, and low-costs technologies are already available thanks to the push to make automation a reality in the transportation marketplace. Continental has already stated that it is ready to scale the technology in order to meet OEM manufacturing requirements. With companies already providing robust automotive solutions, it should not be difficult to make the transition to these technologies. Even more, with many different sectors moving towards the smart city concept, the technology showcased by Continental could fit quite well within that model. Smart cities of the future will require a 24/7 level of urbanized development. Concepts like the CUbE can meet the needs of smart cities and the complex challenges of dense urbanization. As always, there will be peaks in demand, and in some cases human delivery intervention will be required, but in situations where peak rush hours are low, robotic delivery could become standard. Many people are not even home during the day when deliveries or made. This makes robotic delivery especially perfect for off-peak hours when the individual receiving the package isn’t home to take delivery of it. With the smart city already on the horizon, Continental is not the only company taking advantage of this change and positioning themselves to be at the forefront of it. Amazon, the disruptor-in-chief, is also leading the way in introducing these new technologies. Amazon recently showcased the Amazon Scout, which is a cooler-sized, electric, six-wheeled delivery robot. The company is now testing the robot in Snohomish County in Washington state. The robot is designed to roll along city sidewalks at walking speeds and deliver packages to customers in concert with autonomous delivery vehicles. According to Amazon, customers who live in Snohomish County will receive their orders either through an Amazon partner (SEE: Human) or through the Amazon Scout. The pilot period for the Scouts will involve six devices and they will work during normal business hours on Monday through Friday. The Amazon Scout is designed to autonomously follow their delivery route, but in the case of this pilot, they will be accompanied by an Amazon employee. During the engineering phase of the device, it was developed to safely and efficiently navigate around pets, pedestrians, or any other obstacles that may prevent safe forward motion. Snohomish County officials are excited to partner with Amazon on this venture, stating that the Amazon Scout will represent a way to deliver better service to their constituents. And with Amazon being a home-state company, Washington officials in cities and towns all over the state are used to working with Amazon on developing new cutting-edge technologies. Except Amazon is not stopping at small, autonomous, last-mile delivery. Jeff Bezos and his enterprising company are inching ever-closer to launching their Amazon parcel delivery service. As we get closer to Amazon actually moving forward with this concept, it would represent a direct threat to its current delivery partners, FedEx, UPS, the USPS and many others who currently handle Amazon deliveries. Amazon has been quietly leasing cargo aircraft, signing new maritime shipping deals and contracts, and building up their own in-house stable of truck drivers, whether in the United States or overseas. In fact, their efforts in this area have been no less than staggering in scope. While some think that Amazon could simply be posturing to put pressure on motor carriers and reduce shipping costs, others state that the moves are very real and that the company is seriously looking to move into the trucking and logistics space. If Amazon does end up moving into the trucking space, the technological and logistical disruption throughout the trucking industry, on a global scale, will accelerate on a massive scale. Jeff Bezos is the world’s richest man today not because he was lucky, but because he has shepherded Amazon through emerging technologies, massive innovation, and major disruption. If he sees entering the logistics sector as a surefire way to save money, all while raising overall efficiencies, there is no doubt that he will do just that. In doing so, it is virtually assured that all options will be on the table. Whether it be drones, autonomous “scout vehicles,” entirely new distribution chains, or fancy warehousing techniques, Amazon will not hold back in doing whatever it takes to fulfill their mission as they see fit. They may even employ technologies we have not yet seen. And although Amazon has never operated in the transportation and logistics space and Jeff Bezos does not come from a trucking background, neither he or the company have any qualms about utilizing a particular technology or fuel management approach if they feel it would be a benefit to the company and its bottom line. The question now is this: How will all the disruption impact the trucking industry? There are pundits on both sides of the debate, with some thinking that this will merely increase the opportunity for quick-thinking transportation companies and others shouting that it will mean the end of the trucking business as we know it. Smart money is somewhere in between. While motor carriers who cannot quickly adapt to the changing environment may feel themselves squeezed to going out of business, truck drivers, technicians, and others up and down the supply chain will still be needed to ensure packages get to where they need t go and freight gets moved. As with any other major industrial change, there will be some initial pain, but the final outcome is far from a done deal.